In this post I will cover SCCM 1902 new features. The first Configuration Manager current branch update of 2019 is available. Yes, the SCCM 1902 update is available as an in-console update. You can install the update on sites that run version 1710, 1802, 1806, or 1810. Guess what SCCM 1902 is a baseline version as well. So you can either upgrade your site to version 1902 or use the baseline media to install the version 1902 from scratch. Expect Download link soon. SCCM 1902 update can be installed from Updates and Servicing node of SCCM console. Take a look at my Configuration Manager 1902 step by step install guide here. Let’s get started with SCCM ConfigMgr 1902 features. Note – Configuration Manager 1902 drops support for Linux and UNIX as a client. We all know this was already announced with version 1802 release. The solution to manage Linux servers is using Microsoft Azure Management. So now we will take a look at some of the best SCCM 1902 features. Apart from the features mentioned below, there are lot of other improvements as well. You can read about those features here. To take full advantage of new Configuration Manager features, after you update the site, also update clients to the latest version. One of the most important task of ConfigMgr admins is to ensure all the client agents are healthy. This is true everyone because the deployments only reach healthy clients. Unhealthy Configuration Manager clients adversely effect overall compliance. 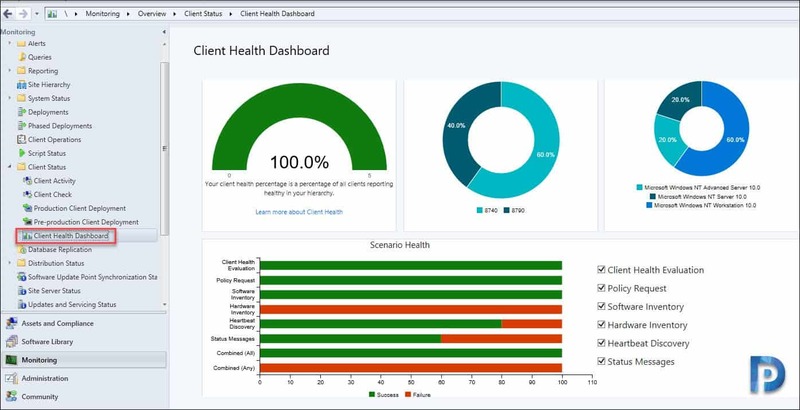 In SCCM 1902, a dashboard shows you health of Configuration Manager clients in your environment. You can also view client health, scenario health, and common errors. In addition to that, you can filter the view by several attributes to see client versions, etc. Under Scenario health you get to select any of these or all the options listed below. Expand Client status, and select the Client health dashboard node. If you look at previous tech preview releases, with almost every release new management insight rules have been added. Management Insights provide information about the current state of your environment. Read more about management insights in my blog post here. management and improve performance. Review these new rules in the Collections group. 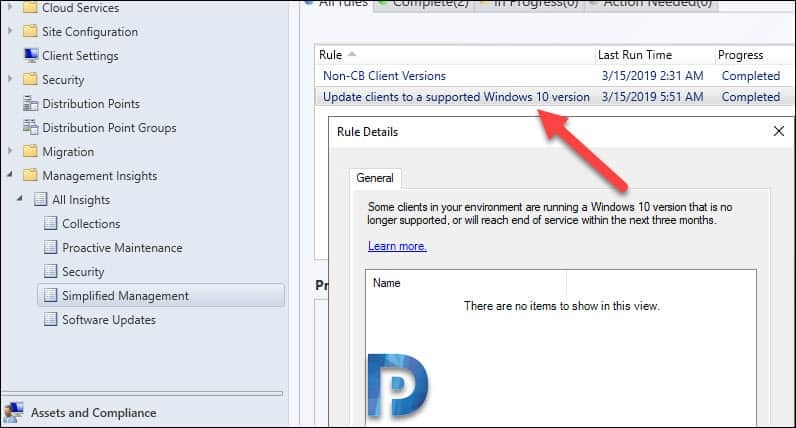 2) Update clients to a supported Windows 10 version rule in the Simplified Management group. This rule reports clients that are running a version of Windows 10 that’s no longer supported. It also includes clients with a Windows 10 version that’s near end of service (three months). Finally my requested user voice item is implemented. Thank you everyone who voted for my idea and thank you product team for implementing this feature in SCCM 1902. 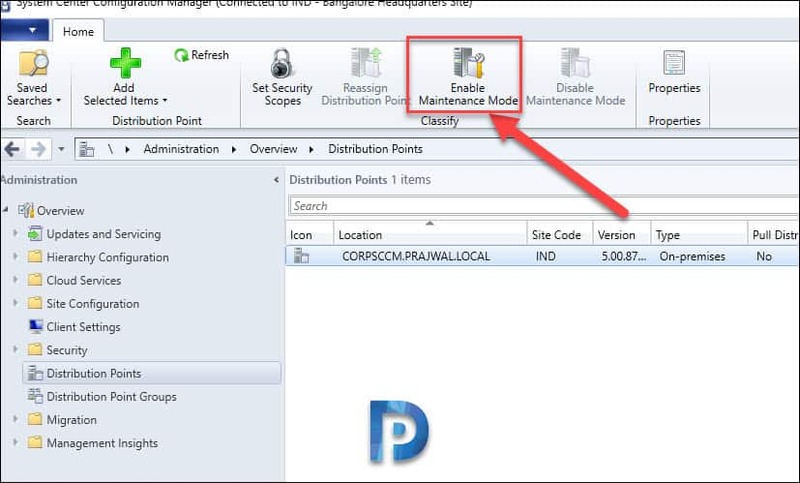 Here is my blog post on SCCM distribution point maintenance mode. What is Distribution Point Maintenance mode ?. 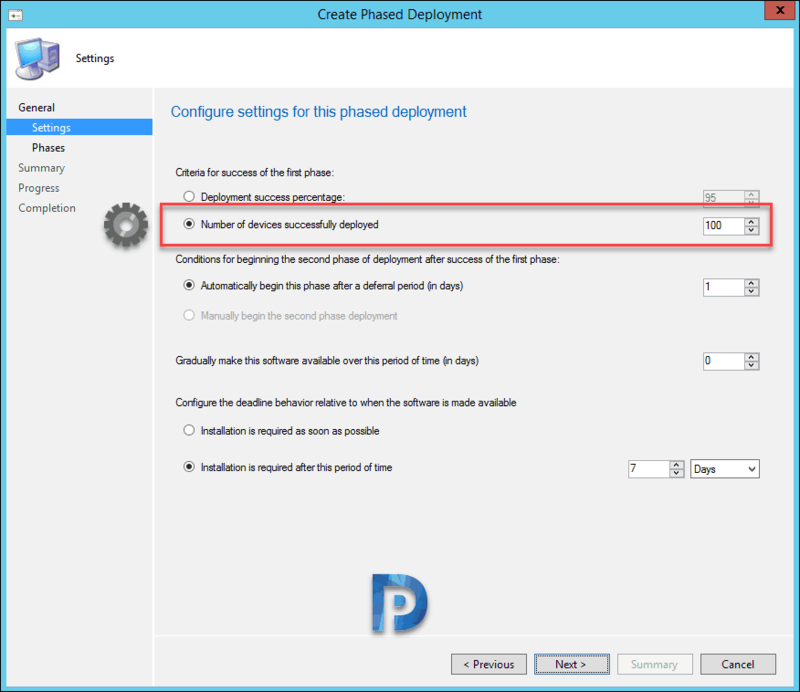 – With ConfigMgr 1902 you can now set a distribution point in maintenance mode. You enable maintenance mode when you’re installing software updates or making hardware changes to the server.I will publish more about this in another blog post. Your site doesn’t distribute any content to it. Management points don’t point the location of this distribution point to clients. Most of all, the distribution point properties are read-only. Any scheduled task such as content validation, still runs on the same schedule. 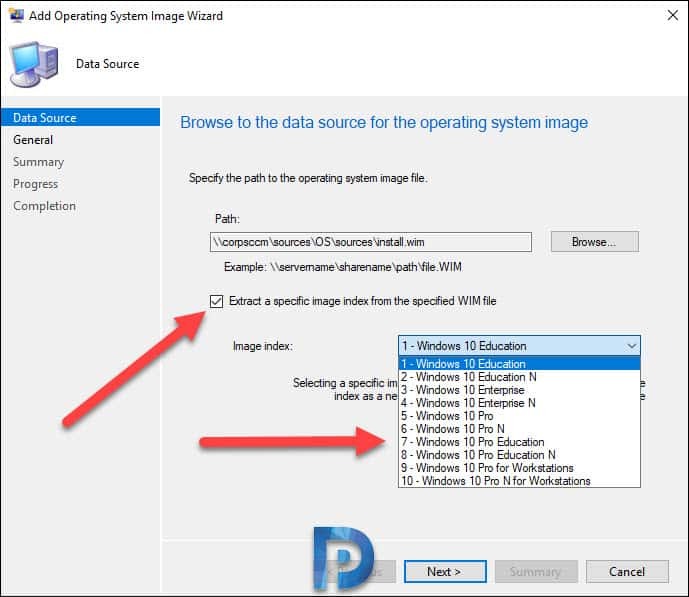 In SCCM 1902, when you import WIM file, you can now import specific index to rather than all image indexes in the file. With this option, you will have a smaller image file and you can perform faster offline servicing. WIM file. From the drop-down, select the image index. With Configuration Manager 1902, you have the option to replace toast notifications with dialog window. Most of the times users don’t see the Windows toast notification about a restart or required deployment. Then they don’t see the experience to snooze the reminder. This behavior can lead to a poor user experience and IT would be blamed for all this. However we have a solution for this. Now when deployments need a restart or software changes are required, you have the option of using a more intrusive dialog window. This setting is found under Client Settings > Computer Restart > Device Settings. 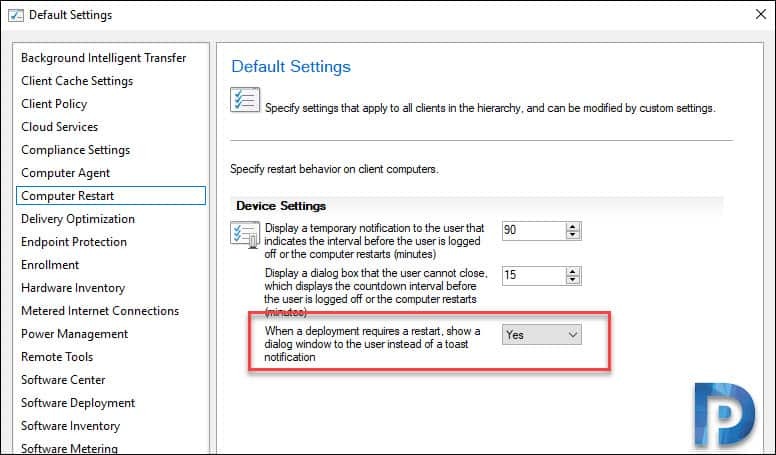 Look for the setting When a deployment requires a restart, show a dialog window to the user instead of a toast notification. To enable this, click drop-down and select Yes. Configuration Manager now supports all supported languages for Office 365 client updates. Office products on lifecycle dashboard which now includes information for installed versions of Office 2003 through Office 2016. Office 365 client management dashboard now includes a new tile, Office 365 ProPlus Upgrade Readiness. Use Configuration Manager 1902 to move Windows known folders to OneDrive for Business. I was very sure that below two improvements will make it to current branch version 1902. I had covered about these features in SCCM 1902.2 technical preview post. During an in-place upgrade of Windows 10, you now see a more detailed progress bar. This bar shows the progress of Windows setup. In case the TS fails or gets stuck, apart from viewing the smsts.log file, you can also find out at what step the task sequence actually failed or is hung. This feature works with any supported version of Windows 10, and only with the in-place upgrade task sequence. With previous versions of SCCM, the users could set their device as primary device via application catalog. Now users can set their primary device in Software Center. Open the software center and click Options. Under Work Information, check the box “I regularly use this computer to do my work“. This action makes them a primary user of the device in Configuration Manager. You can now customize your end user’s default application layout and default application filter in Software Center. SCCM 1902 comes with lot of new features and improvements over previous version. To take full advantage of new Configuration Manager features, after you update the site, also update clients to the latest version. Have you been able to test the more intrusive dialog window? I enabled the setting and set updates rolling to the machine and I am only still getting the toast notification for restart and dialog box when reboot pending? Does this only occur on certain rules?